You’re no doubt aware that there’s a BluRay and DVD re-issue of “Yellow Submarine” due in May. There’ll also be a re-issue of the “Yellow Submarine Songtrack” CD too. But what will we actually get that is really “new”? The Beatles site says (quote): “Bonus features for the Yellow Submarine DVD and Blu-ray include a short making-of documentary titled “Mod Odyssey”, the film’s original theatrical trailer, audio commentary by producer John Coates and art director Heinz Edelmann, several brief interview clips with others involved with the film, storyboard sequences, 29 original pencil drawings and 30 behind-the-scenes photos. Both Digipak packages will include reproductions of animation cels from the film, collectible stickers, and a 16-page booklet with a new essay by Yellow Submarine aficionado John Lasseter (Chief Creative Officer, Walt Disney and Pixar Animation Studios)”. Listed on the back in that yellow box breakout are the Special Features. They are: a short making-of documentary titled “Mod Odyssey”, the film’s original theatrical trailer, full length audio commentary, interviews with crew and vocal talents, storyboard sequences (including two not used in the original film), original pencil drawings, behind-the-scenes photos, a collectible booklet, and a music-only track highlighting the film’s score. So, this new addition coming in May adds what exactly? I figure it’s the “….reproductions of animation cels from the film, collectible stickers, and a 16-page booklet with a new essay by Yellow Submarine aficionado John Lasseter”. Apart from the individually hand-cleaned, frame by frame digitisation – which I’m sure is going to look fantastic – there’s not a real lot else I’m afraid. I’ll probably get the BluRay (the complete-ist in me will have to have it), but I just wish Apple Corps and the remaining Beatles would stop forcing us to re-purchase stuff we already have and re-issue some genuinely new material. This entry was posted in Beatles, Beatles Love, Beatles Music, Beatles related DVD and tagged Apple Records, Beatles, Beatles Collecting, DVD, Music, Yellow Submarine by beatlesblogger. Bookmark the permalink. I think that the “hand-cleaning” process was done already before MGM released it in 1999, so this is probably just a new transfer in 1080p quality. With any luck, they may have found a better copy of “Mod Odyssey” this time. 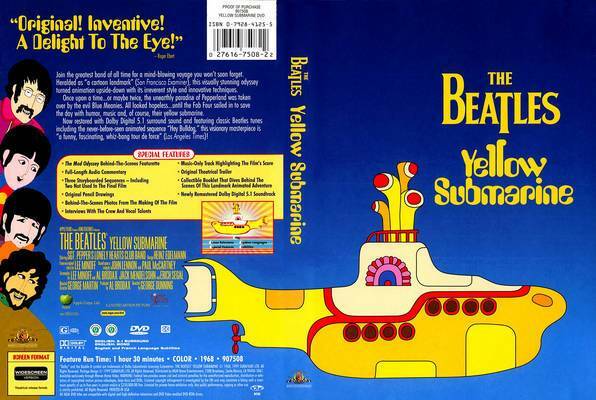 Apart from that, it’s just repackaging – but it was necessary to re-release “Yellow Submarine”, because the 1999 MGM DVD is not available any more in USA, and the rights to release the film has reverted back to Apple. They should have included the 1999 promo film of “Hey Bulldog”, though. As much as I’d like a remastered DVD of Magical Mystery Tour and Let It Be, I’d much rather have previously unreleased stuff too, like for instance a dvd of The Shea Stadium Concert and any live concert cd of the many tapes that Apple is sitting on. Or how about another cd installment of The Beatles Anthology? There’s tons of audio that has not been released, or even bootlegged for that matter. There’s one thing that will make it worth my while: the Bluray will most likely have a multichannel lossless soundtrack in either Dolby TrueHD or DTS-HD Master Audio. That will be the highest resolution Beatles (music) digital audio available to date, near as I can tell. Hi Michael – well that IS another aspect to this re-issue thing that I hadn’t considered. The quality of the audio. It’ll be interesting to see if you are correct when it comes out. If I were in charge of the Beatles’ recorded legacy, it’s certainly the angle I’d be pushing – on this and future reissues. As you rightly pointed out, there’s otherwise not much else to entice the many people who bought the DVD when it came out last time. I’d prefer to see the original 4:3 screen ratio of the film than that dreadfully forced 16:9 wide-screen they gave us in 1999. I hope to see much more detailed picture as well. Anyway, the news is quite satisfying to me.